The earth is a giant ecosystem that deserves our protection. Without our environment, we would be unable to thrive as humans. 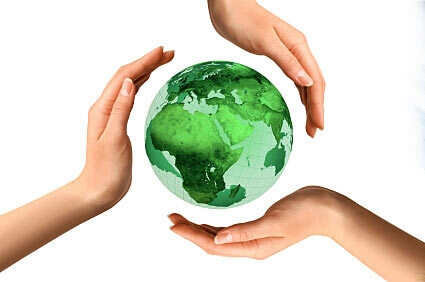 It’s up to each of us to do our part to help protect the environment. Any time you can reduce the amount of water you use, save on using gasoline, reduce the use of electricity, prevent items from going into landfills or save on natural resources, you help protect the environment in important ways. Compost food leftovers instead of throwing them away or sending them down the garbage disposal, which needs water and electricity to run. You can then use the compost for your garden. Walk or ride a bicycle to work or to run errands instead of driving a car or motorcycle, which both use gasoline and emit carbon monoxide into the air. Start a small backyard vegetable garden. You’ll save multiple car trips to the grocery store for common and easy to grow items like zucchini, tomatoes, carrots, lettuce, onions, potatoes, scallions and garlic. Grow an indoor herb garden in your kitchen window. Snip the herbs as needed to keep your herb plants growing indefinitely. You’ll save using gas on trips to the grocery store for last minute fresh ingredients like basil, thyme, oregano and sage. Lead the fight for conservation efforts in your own community. Lobby your local town hall for better environmental practices throughout local neighborhoods. Spot clean clothes instead of throwing them in the washing machine every time a little spill happens. You’ll end up washing fewer loads over time. An hour before bedtime, switch from electric lighting to candlelight. That’s a savings of seven hours of electricity use each week, plus the candlelight will be more conducive to a good night’s sleep. Resist the temptation to buy every new gadget that hits the market. New gadgets usually use electricity, and the more you own, the more energy you’ll waste. Recycle electronics instead of throwing them away. Programs that recycle electronics may even pay you to do so. 10. Allow hair to air dry instead of using a blow dryer every time you wash your hair. Not only is it better for your tresses; you’ll save on electricity use. Eat more raw food items like salads and crudités. Cooking using energy and water. Cook a week’s of meals in one day. Cooking one dish for an hour takes up a lot more energy than cooking an entire roast or entire menu in the oven during that same hour. Encourage your family to eat meals together. If all family members are eating on individual schedules, that’s more microwaving, more baking, more refrigerator door openings than if everyone eats at a set time and multiple meals are made at one time. Consider second uses before you throw anything away that will end up in the landfill. Onions bags can be used to scour the sink. Bread ties can be used to control electrical cords. Large plastic bags can be used to line wastebaskets. Paper bags can be used to store leftovers in the fridge. Buy only the amount of paint you’ll need to finish a project. If you do end up with leftover paint, donate it to a place like Habit for Humanity or a local school or community center. Invest in a home water filter and use tap water to fill up glass or stainless steel water bottles instead of buying and drinking bottled water. Set up rain barrels in the backyard to capture rainfall. Use the water to wash garden equipment or for irrigation of your lawn and garden. Throw on a sweater and wooly socks instead of turning up the heat in winter. Replace light curtains with heavy thermal drapery in cold months to keep warmth inside the house. On hot days, clean shutters closed to help keep the house cool so you don’t have to rely so much on air conditioning. Unplug the TV and other appliances that create a slow electricity drain with LED lights that are constantly on. You don’t need to know the time on your cable box while you’re sleeping. Invest in a plentiful supply of cotton kitchen towels and rely on them to clean up countertops and spills instead of buying an incessant supply of paper towels. Consider buying a reel mower to cut your grass instead of a gasoline or electric-powered mower. Reel mowers use nothing but muscle to get the job done, plus cut down on noise pollution. Don’t buy individually wrapped items like candies, cookies and medicine. The more wrapping, the more the environment is harmed. Use manual tools instead of electric whenever possible. Ban the drill and opt for a screwdriver instead. Use a hand saw instead of miter saw or chain saw. Replace a battery or electric powered alarm clock with an old-fashioned wind up model. It will work just as well without using up energy. Buy products with less packaging. The more natural fruits and vegetables you buy, the less packaging will be involved. Buying in bulk will also cut down on packaging materials. Place produce directly into your shopping cart or into personal reusable bags instead of pulling a produce plastic bag from the dispenser every time. Use twine and fabric to wrap and tie gifts instead of paper printed wrapping paper and cellophane tape. Get rid of carpet in the home so you never have to run an electric vacuum again. Instead, use a broom and/or mop to keep floors clean. For smaller area rugs, use a manual carpet sweeper. Make recycling easy in your home. Place dedicated recycling receptacles everyplace where waste is; in the bathroom, home office, bedrooms and kitchen. Remember that paper tissue is recyclable, as is most office paper waste, including shredded paper. Keep a list of recyclable materials posted on the inside of a kitchen cabinet door for family members to refer to. Common items like plastic bags, aluminum foil, paperboard liners, and beer tops are easily recycled, yet many people forget to do so. Have the kids ride bikes to school and jobs instead of taking the bus or driving. Extra bus stops mean more fuel expended, and every time the car is driven, gasoline is used. Make one night a week a “no-device” night. Turn off electrical devices and play a board game, tell stories or go for a family walk. If each person does their part to help protect the environment for future generations, then we can turn around what has become a hazardous situation. Your efforts to protect the environment don’t have to be on a grand scale. No one is asking you to sacrifice your lifestyle or comfort. These 50 ways that you can help can all be done by anyone, no matter your economic status or living situation. The best part is, you won’t even notice a difference in your daily life; but the world will notice because the environment will become better, little by little. It’s not too late.